Kylie Jenner’s reign over the most liked photo in Instagram history has been cracked thanks to the efforts of nearly 51 million people. After the start of the world record egg page on Instagram only a few weeks ago, the post of a simple brown egg has skyrocketed in popularity. 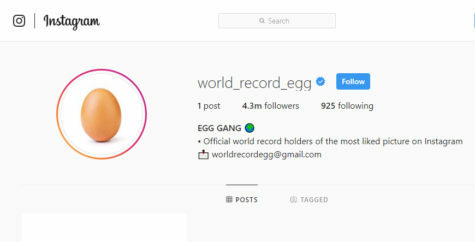 The account, simply named “world_record_egg”, set out to set a new record for the most liked photo on Instagram, challenging Kylie Jenner’s record of 18 million. The previous record, achieved in February of last year, was quickly smashed by the new-found internet sensation. After being posted January 4th, people scrambled worldwide to support the little egg’s big dreams. The young makeup mogul has yet to comment directly about this, but we are sure that she will want to turn the egg into an omelet with another hit photo.